Donald Trump is currently on his first trip abroad as President, and the Media Party is running fake news to discredit what has been a successful tour. The media criticized Trump for not using the phrase "radical Islamic terror" during his speech in Saudi Arabia, even though they attacked him for using the same line in his inaugural address. In Israel, Trump made history as the first sitting President to visit the Western Wall. The media instead chose to focus on him and the First Lady not holding hands. WATCH my video to see my analysis of the media's latest assault on the President, and how they even went as far as defaming his meeting with Pope Francis. Here’s the narrative about Trump’s historic overseas tour on CNN: This just in, Melania wouldn’t hold Trump’s hand. The pope looked grumpy in a couple of pictures with Trump. 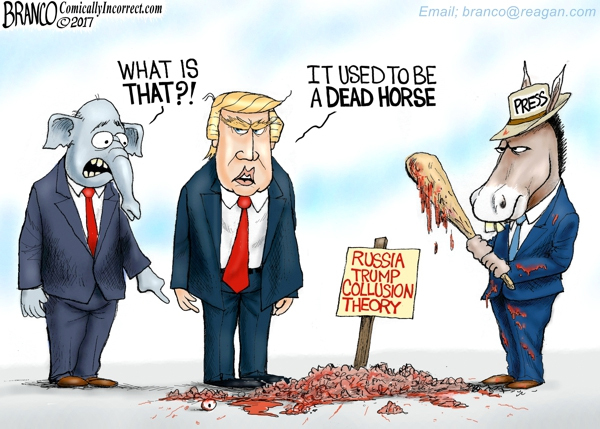 Trump….Russia, Trump….Russia, Trump….Russia, Trump….Russia, Trump….Russia, etc, etc. LOL. Bunch of pathetic robotic bumbling stooges. This doesn’t look much like obvious 24/7, 100% propaganda by the left does it? At some point the chattering classes will have the tables turned on them…and payment will be due! Their lies, criminality and treason will not be salved by a mewling, ‘I was only following orders, everybody else was doing it.’, prostrate before a judge. They condemn themselves daily and it’s all recorded and on the internet. LOL! Space Moose, when it’s a slow news day & they can’t come up with a new headline about the Russians, msm back up plan includes stories about President Trump’s two scoops of ice cream. I just love how much the news media cares about Trump and his two scoops of ice cream. Imagine where the western world could be at if the MSM leaned to the right like they do to the left, cheerleading on right wing politicians and denigrating all the ones on the left. On another note, I must say I have some reservations about all this cozying up to the Sunni Saudis. It’s hard to say who produces more terrorists, them or Iran. Isis is Sunni and they all hate Israel. Actually I still think that since the 9/11 jihadis came from Saudi Arabia and that was Bush’s excuse to start the war on terror, he should have invaded Saudi Arabia instead of Iraq. The US would now have their oil, their gold and a very strategic position to keep a lid on things. Never mind freeing the people of a brutal regime. Just sayin. I hope Pope Francis did not decry President Trump’s plans for a wall during the visit…after all, Vatican City is completely surrounded by a huge wall. Isn’t it ironic!? EWTN had live coverage of Pres. and Mrs. Trump’s visit to the Vatican. The ONLY media to cover their visit. Pope Francis seldomly smiles for pictures but smiled the entire time they were there. Also, it was just announced today on EWTN that Melania Trump is Catholic. Let’s see if the msm reports this and ‘what’ they do with this information. The coverage was, as Donald Trump would say, ‘fantastic’! Rob Greely good point, Trump is more about the people and the elites just do not get it. The elites think they are here to control us. The fake media is only fooling those who are already fooled. They are sadly trying to look like they count for something when they do not. The most pathetic part is that they have become so self important and idealized that they do not know any other way. They only have themselves to blame for their descent. Mr. President Trump was in direct contact with the American Everyday People..Canadians can also do the same and share your thoughts to Mr. President Trump about trudeau and the liberal clan in Canada. Sure he’s got a lot on his plate..but he works 7 days a week, 20 hour work days…trudeau? didn’t he just order he won’t work on Friday’s and only have a question period where he did not answer the same question repeated 18 times! What da Goof you are trudeau. Be careful about doing journalism Jack. You’re getting recognition in mainstream. What was that gross specimen of Humanity PM Trudeau doing through all this? He was sticking, like glue, next to PM May. He new that President Trump would be offering his condolences to her over the bombings and he new that trump had to apologies for the American Security leaks about the bombing. He also new that Theresa May would be getting a lot of photo and video coverage because of this. Canada’s PM can smell Photo Ops. What an embarrassment he is. Thanks for your report Jack. Msm are predictable, in that they must broadcast a daily dose of Trump bashing; Rebel supporters look for balanced reporting. I found it, and conclude, President Trump had a very productive trip. I never liked the term “fake news” because it in itself is a “fake” term – it’s an abstraction, a diversionary term that glosses over the ugly reality that much of the 4th estate has become the 5th column spreading lies and fraudulent narratives which purposely deceive the public and knowingly serve the agendas of enemies of the people. The anti-Trump media in its venal aggressive open loathing of a populist POTUS is essentially revealing itself as an anti-democratic tool of the elite aligned against popular will – what is it that scares them so much about Trump’s drain the swamp agenda? Are they deeply tied into “the swamp”? It appears so. It’s a type of gauge. The more the main stream media keeps attacking, maligning and lying about Trump, the more we know Trump is doing what is best for the US. And typically what is best for the US also spills over to what is best for Canada, even if the Left is too stupid to grasp that. President Trump can’t stand the media, because they are liars. The media can’t stand President Trump because they wanted Clinton to win and they have no idea what truth is. Trump’s overseas tour was a big success. MSM will burn in hell for their part in the destruction of democracy and the west. More reason why alternative media must thrive to spread the real news. I have often thought how I would love to have enough money to buy out one of the MSM outlets, and turn the tables! Would likely involve some serious purging I suspect! The MSM were bought and paid for by globalist politicians, through the UN, which is why they have become liars and deceivers of the first order. Lying and gnashing of teeth applies to these junk journalists, who are being paid to undermine Trump to the people. I don’t believe anything they say! Thanks for telling us the truth, Jack! The day I read the news about Trump’s electoral victory I thanked the Lord he won instead of Clinton. Although I’m Canadian I believed, and still do, that only Trump could do what’s needed to set America back on its proper course. Since then, all the media large and small, cannot seem to write anything good about him. I live in a small community and even the local rag cannot write about politics – local, provincial, or federal – without tossing around some sort of slanderous comment about him. It is beyond disgusting, it is pure evil. Who cares about what the traitor media says? They are a bunch of low IQ hypocrites and liars. However, how can the muslim world drive out radical islamic terrorism when this is what they are.